The annual Pennsylvania Farm Show is the largest indoor agricultural exposition under one roof in the nation, with nearly 6,000 animals, 10,000 competitive exhibits and 300 commercial exhibits every year. It showcases the quality and breadth of Pennsylvania's agriculture industry and the people who make it thrive. And since 2011, PennDOT has been part of action with a display promoting the department, specifically its winter operations. The display is manned by employees of PennDOT's Harrisburg-area district and has several pieces of road equipment for photo opportunities. The public also can stop by and ask questions about PennDOT-specific issues and receive more information about the department's hiring procedures. 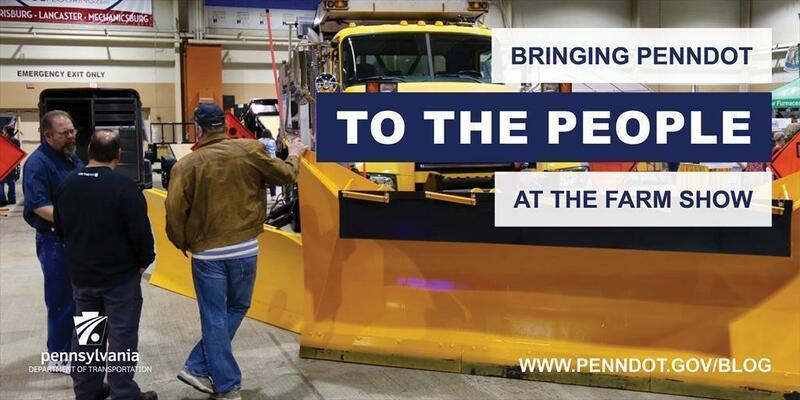 Since the Farm Show is always in the midst of the winter season, it’s the perfect time to educate the public on how PennDOT handles keeping roads safe during winter weather events. Follow PennDOT on social media — Facebook, Twitter, and Instagram.